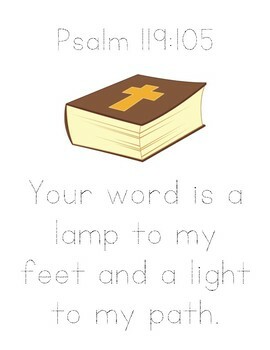 I created a Psalm 119:105 Bible Verse Tracer Pack for Parker to work on this week. I printed the blank tracer page so Parker could trace and illustrate his verse. Later in the week, we cut apart his verse and he pasted it in his lapbook like a puzzle. This week we were reading John 15 and learning that we can only grow fruit when we are connected to Christ. I gave the boys a Fruits of the Spirit coloring page (Bible Story Printables). The boys used their Mr. Sketch scented crayons to color their worksheets. This week we were learning about words ending in words ending with -pt. 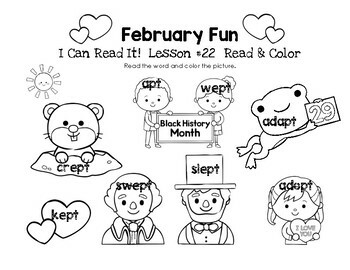 I created a February Fun Worksheet for Parker to work on. Parker read and colored his lesson 22 words. 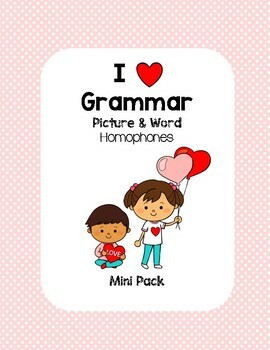 I created a I Love Grammar – Homophones pack for Parker to work on this week. You can purchase the pack here at our TPT Store. There’s a bonus FREEbie in the Preview! First, Parker matched the homophone cards. Next, he used his dot paints to complete the Homophone Heart Match worksheet. 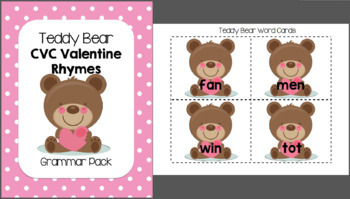 I created a Teddy Bear Valentine Rhyme Pack last year. You can purchase a copy of it here at our TPT Store. There’s a bonus FREEbie in the Preview! I printed the Seek & Find cards along with the coordinating heart worksheet. Parker used his magnifying glass to find the CVC words and dot-painted the matching rhyming heart on his worksheet. This week we read a couple of Cynthia Rylant’s Henry and Mudge books in addition to more winter readers. He really enjoyed reading Henry and Mudge, because his big brother was also studying one of Cynthia Rylant’s books in his FIAR unit. I started creating a Months of the Year Booklet for the boys to work on at the beginning of each month. It’s not complete, but I’ll post it HOPEFULLY soon. The boys filled in the calendar days for February and marked holidays and special events with little icons of their making. They really enjoyed that! They answered several questions using the calendar. We continued learning about the human body this week. We learned about the heart, lungs, and vocal chords. We took a little time to SEE how we use our lips, teeth, and tongues to form various sounds. The big mirror was a hit! I gathered our supplies and headed to the kitchen for some water science activities. We read through this week’s lesson about air taking up space. We looked at the “empty” jars and talked about how they were really full of AIR. Jordan stuffed the paper towel into the “empty” glass jar. He placed it into our water bowl and we saw that the paper towel didn’t get wet, because the jar wasn’t empty at all. It was full of air which pushed against the water, keeping the towel dry. Jordan used our small tube to fill a mason jar full of water. At this point, we found our experiment working perfectly. When we tried to syphon the water into the sink, it failed. I think we need a thicker tubing for this to work. We may have failed this time, but we’ll see if we can get larger tubing and try again. Good, better, best, right? That’s all for week 22! Looking forward to week 23!